Picture from Giant Rabbit Rescue. awww!its so cute!i have a rabbit her names pepsi i love her!shes a netherland dward lop rabbit. 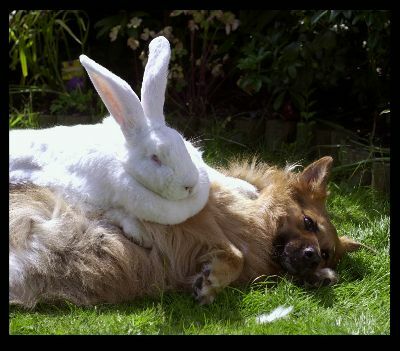 holly crap that rabbit is freakin huge!!!!!!!!!!!!!!!!!!!!!!!!!!!!!!!!!!!!!!!!!!!!!!!!!! this is so cute! i almost fell off my chair laughing! OK! well i think this bunny is the biggest bunny Ever! it looks pretty cute and cuddly i would love to have a bunnie like that but i just cant get them to that size my own 15 or i think it was 16 bunnies i tried to get them all like that but they all ended up eating to much adn now they just lay around my house.. i also LOVE white bunnies adn i kinda feel fo the dog is he ok? i think rbbits are amazing criters. if i could be a criter it would be a little beautiful rabbit. they Are spectacular And Amazingw. Jesus talked to me through a rabbit once. so i chnged the rabbits name to jesus. jesus is my second favmrabbit ever. my first favorite rabbits name is mr.sparckle cakes. please respect rbbits. this is going out to all rabbit hater. WE WILL WE FIND YOU! WE WILL DESTROY YOU! WE DO NOT FAVOR YOU! I AM NOT FOND OF YOU! where do you get a giant bunny?